This rich "Celestial Blue" Dip Mexican Ceramic bowl is 4.5 inches wide, lead-free, dishwasher and microwave safe. Handcrafted and painted by Mexican artisans, the bowl gets 5 stars for functionality and beauty. Check out more items that go with this set from our Azul Celeste Collection or browse the entire handmade ceramic Bold and Beautiful Kitchenware selection. 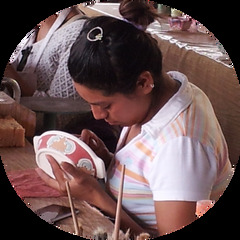 At this family-owned ceramic workshop in the Guanajuato region of North Central Mexico, women artisans hand paint unfired ceramics while men work the kilns, as they have since the late 70’s. Each piece has personality from the dots and swirls to the hand painted logo on the bottom.